Feel free Bec to pass on my feedback to your team. 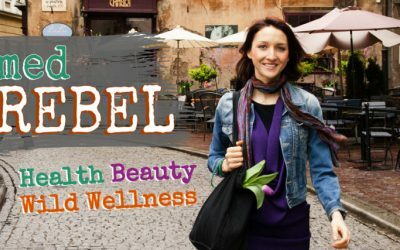 Am very happy to support an all natural, vegan line that gives back to the community and that is wonderful to use! Well it is almost the end of the year and we are all getting our skin ready for Summer! Summer skin needs to be well nourished from the inside and the outside! It also needs to be well protected so don’t forget your sunscreen! I have been using a fabulous moisturiser from one of my favourite, favourite Natural Skincare Companies…The Summit Vanuatu. I love everything about this moisturiser…it’s texture, fragrance, feel on my skin and most importantly…its effectiveness. ​Usually, there is something about a product that I can fault, be it price, fragrance, texture and feel or effectiveness. Not with this moisturiser. It ticks all my boxes for price, natural ingredients, fragrance, texture and feel, and effectiveness. People have been asking me what I have been doing for my skin as my complexion looks clearer and healthier. I am pleased to tell them that the only new thing I have been doing is using the Sandalwood and Ylang Ylang Moisturiser from The Summit Vanuatu! Extra Virgin Coconut Oil, Pure Sandalwood Water, Sandalwood Oil, Ylang Ylang Oil, Pure Tamanu Oil, Natural Vitamin E and Grapefruit seed extract. ​Natural, Healthy, Not tested on animals, Pure and effective. This moisturiser is an all natural, daily antidote for tired, inflamed and sensitive skin. The Summit Vanuatu pride themselves on using only the purist quality ingredients of Sandalwood and Ylang Ylang oils (grown by them) which are anti-bacterial and anti-inflammatory. Also the amazing Tamanu oil is a proven healing oil, which is also one of the most valued oils in the world for healing and rejuvenating skin. 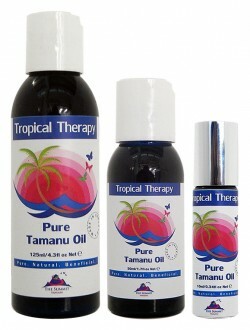 For more information on the benefits and properties of Tamanu Oil you may like to read my review. ​I can definitely see a difference in my skin colour while using this moisturiser. I suffer from Rosacea and always have redness on my cheeks and décolletage…now my skin is even-toned and does not look so red. I would even go so far as to say that my brown pigmentation has also faded and is less noticeable! ​Unlike many companies, The Summit Vanuatu stand firmly behind their products and offer a 100% money back guarantee if you are not satisfied with your purchase! 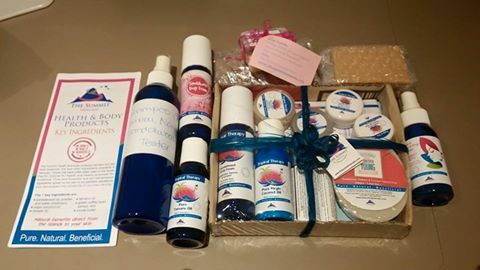 If you love natural skincare that is effective and does not smell like artificial flowers or fragrance, and uses only pure natural ingredients that have research to back up their effectiveness, then you, like me, will love the products from The Summit Vanuatu. As a MD, PhD, focused on dermatology, I am very picky when it comes to skincare. I see the skin, which is our biggest organ, not only through the beauty aspect, but also as a gate to our inner ecosystem. What we put on our skin gets inside the body and can either help us thrive or harm body’s inner delicate balance. What’s more I’m a proud vegan, on the mission for spreading the world with the Green Revolution, aiming for the best, high quality, natural, eco products, both for my clients and myself. That’s why my reviews are always honest and pure – the same way as the skincare products should be. I’ve tried each of the Summit skincare line products for more than 2 months. This period of time, allowed me to truly experience how it influences my skin short and long term. The face, body and hair care lines were founded on sustainable principles to provide high quality fair trade, natural personal care products. The greatest advantage is that the company uses only natural, high quality, ingredients, sourced from Vanuatu Islands, to create their products. Company makes all of their products at The Distillery on site, by hand. They distil essential oils and mix them with other natural and organically grown ingredients sourced from the Islands of Vanuatu to make creams, balms, soaps, and sandalwood hydrosol based health & body products. If you have a chance to visit the place – you can have the pleasure to observe the whole production process. What’s crucial, they don’t test on animals and make the production process, together with labeling, extremely transparent, without any dirty secrets. What’s more, not strictly connected with using the products per se, but still of a huge value for me; the Summit supports local entrepreneurs and growers. Company believes in cutting out waste of all kind and they care for the environment. Packaging is all handcrafted by the Summit team from recycled cardboard, hand made rosettes for gift packs and other local materials. Those aspects play a huge role for me and I’m looking for this kind of information, BEFORE even putting anything on my skin. Why? Because those facts help me to determine if I can trust the company, before even consider trying their products. Simple yet effective start for a skin’s morning routine, as well as night cleanse. 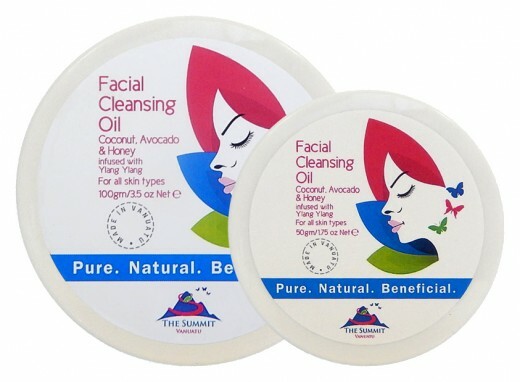 It’s ideal for removing makeup and deeply cleaning the skin. This cleanser does an excellent job, removing all of my makeup! I’m left with clean, soft skin. With a gentle oil blend of virgin coconut oil, pure avocado oil, and pure ylang ylang Oil, it’s no wonder that I fell in love with this product. Plus the scent – it’s really relaxing. Research has shown that coffee extracts boost could be beneficial to the skin, with regard to reducing puffiness, because of their anti-inflammatory properties and brightening/reducing dark under-eye circles by increasing circulation. Facial and Body Polish is a powerful, yet very gentle skin exfoliator. It leaves the skin super soft and moisturized. The package size (50g) could be bigger, when considering using it as body polish. As it has wild honey as one of the ingredients, some strict vegans may have a second thought before using it. The scent – for me is magical and exotic, but may be to strong for some people. It’s more of a personal take. You won’t know if you don’t try! After using the Summit skincare line, I found my skin firmer, repaired and replenished. 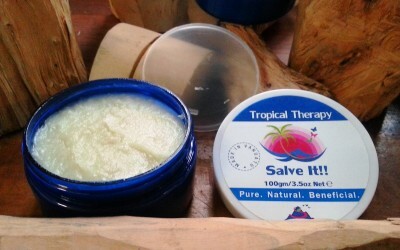 As I have dry, demanding skin, they helped a lot, especially during the cold wintertime. My skin feels and looks amazing after using this combo! Putting my scientific hat on: the line has potential to help with so many skin issues, like for example acne, fine lines or hyperpigmentation. All of the products seem to last for a while, even with everyday use. I highly recommend trying the Summit skincare line. Not only your skin will thank you, but you will also help to heal the world. Each month I like to bring to your attention a great product that I have personally tried, and think is well worth others trying. These products are becoming some of my all time favourites as they are natural, organic and are reasonably priced for the quality and quantity of their ingredients. I am particularly partial to two companies who consistently demonstrate their commitment to the environment, use organic and natural ingredients, are vegan friendly and are not tested on animals. The first is an Australian Company Happy Organic Skincare and the other is The Summit Vanuatu. Both these companies, I believe, produce some of the best products I have ever tried and now regularly use. 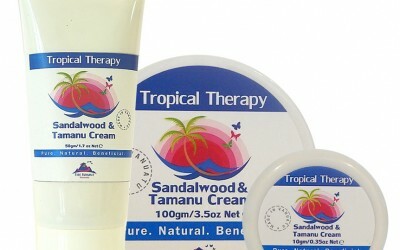 So it will be no surprise to you when I choose another gorgeous product from The Summit Vanuatu. 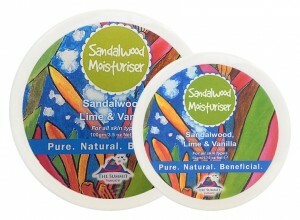 This month my choice is aSandalwood Facial Moisturiser infused with Ylang Ylang. I absolutely love this moisturiser! The fragrance is amazing, especially if you like the scent of Sandalwood and the fragrance of Ylang Ylang. This moisturiser is a no gimmick product…it doesn’t promise you that your wrinkles will disappear over night, or that in just 4 weeks you will look 10 years younger! What it does do is moisturise your skin beautifully with natural healing oils that are anti-inflammatory, antioxidant, antiseptic and intensely hydrating. This Facial Moisturiser with Sandalwood and Ylang Ylang has all you need in a moisturiser. All products from The Summit Vanuatu are packaged in recycled materials as part of their commitment to sustainable farming and looking after the environment. Just browsing their website is inspiring! Unlike many other cosmetic companies, The Summit Vanuatu offers you a money back guarantee. If you don’t like your product they will give you your money back… and they offer free shipping for all orders over $100! The Summit Vanuatu certainly stand behind their products and I can understand why…they are simply excellent products at a very reasonable price. 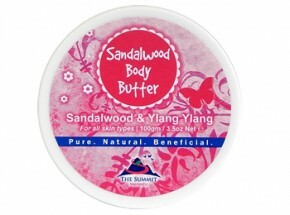 A generous 100g jar of Facial Moisturiser with Sandalwood and Ylang Ylang is only $19.95! and the 50g jar is only $12.95. In my opinion, that is an excellent price for a more than excellent product! This versatile beauty is a multi-tasking, super efficient, get the job done, no nonsense lotion which nourishes your skin from your face to your hands to your toes. Rich, emollient, softening and moisturising – this tantalizing all purpose lotion has it all. 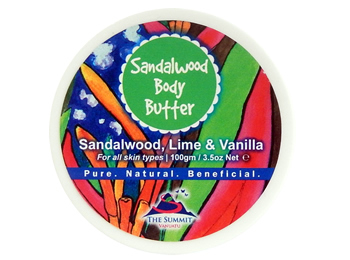 I’ve been using The Summit’s new Sandalwood Body Butter now for over a month and feel a real difference in the hydration of my skin. The scent is a refreshing mix of cardamom and mandarin, with a creamy texture that my skin just drinks up. It’s difficult to find a body moisturiser that is wearable in our humid tropical climate, but I think I’ve finally found the one. Definitely a staple in my bathroom, I love it! Pamper yourself with a voluptuous whipped cream concoction of cocoa butter, nangai oil and sandalwood water. The velvety texture, pleasant fragrance and emollient properties of cocoa butter and nangai oil are joined by the antiseptic and anti-inflammatory benefits of sandalwood water. This means your skin will be so protected, nourished, supple and alive, but never greasy. I wanted to pass on some feedback on The Summit’s Canarium Nut Body Butter (Sandalwood, Lime and Vanilla). I have used it a couple of times now and absolutely love it – amazing texture and really lovely smell. Perfect moisturiser for slightly dry skin. I am a big fan of The Summit products! 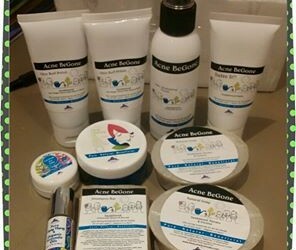 The Acne Be Gone range is the best treatment that I have ever used for my pimples. I have tried almost everything and nothing worked for me. After just using the soap, toner, and tamanu oil overnight, I noticed the next morning that the existing pimples have dried out. And not even a couple of weeks later, my face has started to clear up. No more breakouts. It feels so smooth and doesn’t look dull anymore. I’m so grateful for my friend Michelle from the Summit who introduced me to their wonderful products. They are highly recommended! Will definitely continue buying and might try the other product range. My 1st Batch of Order before Acne Be Gone Range was introduced to me. Wonderful collection of many new feedback! Hi Ladies, great to hear from you both and glad that all is well. There you go, hope that helps. Also my mother Jennies feedback about the deodorant is she loves it and finds it even more effective than traditional deodorants, especially on the dreaded synthetics which usually get quite pongy. My cousin Adrian and I both agree that we both feel that as it is not an anti-persperant that our whole body feels like it gets less hot and breathes better. The list of ingredients are simply natural and lovely! I have had a difficult time trying to choose which product I would feature for June. So…back to my choice for June!I really could not decide which product to choose! 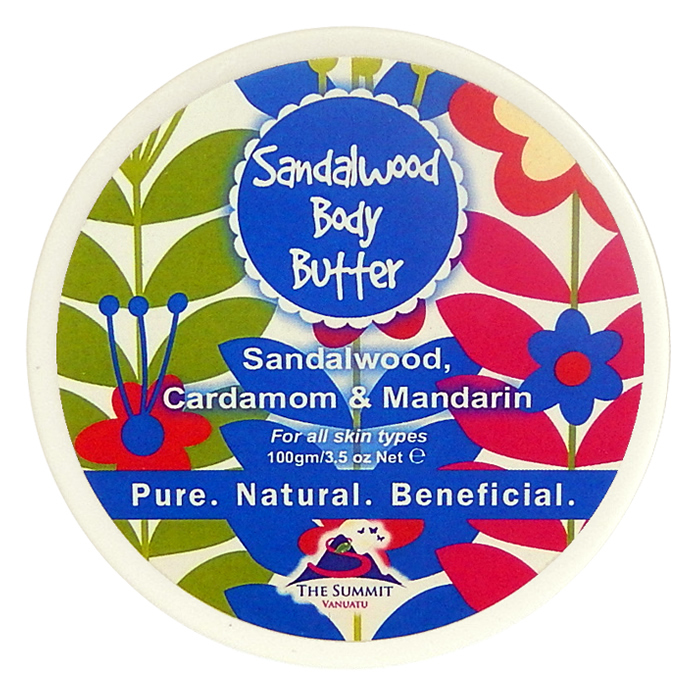 I was torn between Sandalwood Water or the Sandalwood Body Butter, as I feel that both are superior, natural products.It was a difficult decision, but I finally settled onSandalwood Body Butter with Ylang Ylang, a rich, fresh and earthy butter for the entire body. I have not written a review of this product as yet…but it certainly deserves one! This body butter is light, yet rich and covers your body with a veil of moisturising oils and sandalwood. I love the feel of it on my skin. It is soothing and I love the earthy Ylang Ylang scent with the fragrance of the Sandalwood Water…smells wonderful! Once again, I am impressed with this company’s ingredients and value for price. At just $19.95 AUD for a generous 100gm, this is excellent value for money. As it is a super rich butter, it goes a long way. All products made by The Summit Vanuatu are suitable for Vegans, have no animal testing, and all products are sourced from sustainable farming and orchards from local farmers in Vanuatu. For more on the benefits of Sandalwood on your skin and sustainable production, visit my Review on The Summit Vanuatu Sandalwood Water. I really am impressed with this company’s ethics, commitment to the local community and economy, and their encouragement for local farmers to be environmentally aware and replace their resources. If you are looking for an all natural product to generously lather over your skin, then this body butter ticks all the right boxes! The list of ingredients are simply natural and lovely.Extra Virgin Coconut Oil, Sandalwood Water, Cocoa Butter, Nangai Oil, Ylang Ylang Oil, vegetable derived emulsifying wax, Natural Vitamin E, Grapefruit Seed Extract. That’s it! No hidden nasties! Free Shipping is offered for orders of $100…and believe me…you can purchase a lot of lovely products for $100! It will feel like Christmas when you unpack your box of goodies! I know that from experience!